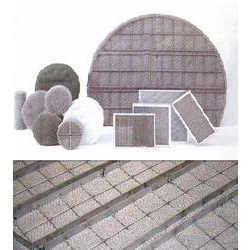 Our range of products include ss knit mesh and knit mesh. With our vast experience in this domain, we have enabled us to serve our clients with a broad array of SS Knit Mesh. It is utilized for the purposes of removing mist and entrained liquids from a gas flow in the industries. This mesh is made available in different finishes and specifications to comprehend the varied requirements of our prominent clients. In addition to this, this mesh is designed and manufactured using the optimum quality raw material and advanced machines in obedience with set industry standards. Our organization is also engaged in the manufacturing high efficiency Knit Mesh. These pads are utilized for the purposes of removing mist and entrained liquids from a gas flow in the industries. The pads are produced by our trained technicians who carefully knit wire mesh made of material like stainless steel, monel, galvanized iron, Teflon and polypropylene. To secure the pads in a tight position, we use grids made from stainless steel. Looking for Knit Mesh ?